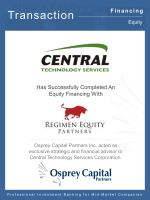 VANCOUVER, BC–(Marketwired – January 20, 2016) – Regimen Partners is pleased to announce their partnership and equity investment in Central Technology Services Corporation. Founded in 1996 and located in Oakville, ON, Central Technology Services Corporation specializes in providing unique customized financial solutions designed to assist large enterprise customers in acquiring their technology assets. By providing a propriety usage-based procurement option, Central removes the financial and budgetary constraints that typically inhibit large-scale software installations. About Regimen Partners: Regimen invests in private, profitable SME’s focused on commercial and industrial markets across Canada. Regimen brings capital and qualified, passionate business partners together with established enterprises seeking growth or succession solutions. Regimen invests for the long term (15+ years) and is not required to sell its investments after a predetermined period. Central is Regimen’s seventh investment overall and the second investment in its Regimen Equity Partners LP private equity fund. Regimen has offices in Vancouver, Edmonton and Toronto.